I AM FUEL, YOU ARE FRIENDS: Roger Clyne Interview: "It's beautiful, and it's life, and there's no incongruity in my mind." Roger Clyne Interview: "It's beautiful, and it's life, and there's no incongruity in my mind." 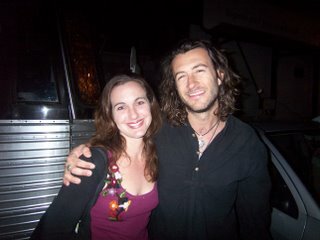 If you've been with this blog since the beginning (all two of you), or else you've clicked through the archives, you might know that Roger Clyne was the first artist I wrote about on I AM FUEL, YOU ARE FRIENDS (in a charmingly rambling & naive piece), because I had just gone to see him in concert the day before I started this blog. I've also followed up with another, more proper and biographical post about him here. 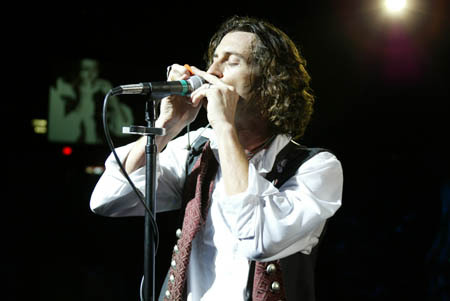 Why do I like Roger Clyne so much? I've only been listening to him for a year or so. The first time I heard two of his songs on a mix CD, I was drawn to his energy and his great rock sound. I vividly remember driving home along the California freeway, windows down, springtime air, thinking that Clyne was a perfect soundtrack to that moment. That's why I am pleased to present to y'all an interview with the man himself, my first artist interview for FUEL. This will probably be my longest post of the year (unless I, uh, get that interview with Vedder), but hang with me. Something is encapsulated within Roger -- his passion for making some truly excellent music, the way he articulates everyday beauty in poetic ways, and his good, good heart -- that compels me to encourage you to get turned on to him too. Whether or not you specifically like his work, I think that the things he has to say will appeal and speak to anyone who truly loves music. Roger Clyne is one of the hardest working artists in rock 'n' roll, and he isn't tired of it yet. The independent model for the operation of his current band Roger Clyne & The Peacemakers (previously The Refreshments) is something that countless other independent artists are also living on a daily basis. It is relentless, involving long months of touring, being away from family and home, working to get your music out there and your voice heard. But Roger would rather do this than anything. You see, it's his calling. 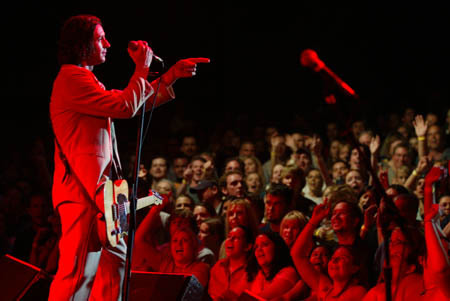 I believe that through this kind of passion and urgency - therein may lie the salvation of rock 'n' roll. I think you are certainly one of the busiest and most active musicians that I have seen in terms of touring and releasing. I wonder is it more work, necessarily, being in an independent rock ‘n’ roll band, versus your time with the Refreshments? Yeah, touring for a good part of the year is pretty typical -- that’s both a necessity and a blessing in an independent band. We don’t operate with any parent company or tour support. Every dollar that we spend on a bus repair – hallelujah - or recording comes from our relationship to the art and to the audience. So it’s really organic, definitely often very very close to the bottom line, but I enjoy it. It’s a thrill. It’s a thrilling ride. It’s the ultimate litmus test to see if art can really lead commerce, and quality can lead quantity. And so far so good. I’m . . . I’m proud. You quoted Paul Westerberg once when he said that rock ‘n’ roll looks a lot easier than it is. You certainly make it look enjoyable, if not easy. Oh, it’s absolutely enjoyable, but that doesn’t mean that it’s easy. There’s another wonderful paradox: it’s an incredibly difficult sport, but once I’m up there, it’s effortless. All the things that get you to the stage – all the planning and logistics, all the budgeting and spreadsheets and phone calls and Mapquest and reservations and contracts that have to fall into place to make a two-hour show happen – that stuff is far more difficult than when I finally get up there, and I get let out of the chute, and I get to take the stage. Then performance seems to me like . . . the closest thing I can conceptualize what Zen is. I think that the timelessness that the masters talk about in the state of Zen, that all-consumptive one-moment feeling, I think that I am coming close to that feeling sometimes when I am on that stage. Sometimes I am interrupted by a technical difficulty or who knows what, but there are times when I’ll have a really really effortless show. I may be physically working hard, but it seems to me like nothing has happened between start and stop, two and a half hours have gone by in a state of just total rapture, I love it. Sometimes in songwriting I’ve had that experience as well. I have an hourglass in my writing room, and typically I require that I turn it over four times when I arrange time for my writing so that I will be there for four hours. There have been times when I will turn the hourglass over and turn to my guitar to mess with the melody or poetry or cadence or whatever part of the song it will be that day, and I’ll look up and the hourglass is empty and I won’t know how long it’s been. And that’s also just a really great feeling. You mentioned your writing room, and you’ve also got a lyric (in “Feeling”) about writing a song on a front porch… is there a specific place where you like to do your songwriting? When I am at home, I have a small piece of my garage that was the former owner’s woodshop. Basically I just painted it a lot of bright colors and hung some stuff in it and put a small uncomfortable chair and my guitar in there for writing. Uncomfortable chair because if I get too far into my creative trance, I’ll go into my sleep mode! If I can get away, I can really write anywhere. I find that the best place and time for me to write is where there are no interruptions from routine things at home – like taking the kids to school, checking email, or answering the phone -- I find those things very, very interruptive to my creative process. I used to be a nighttime creator, but now I find that I work better very early in the morning, like 4am, right out of a sleep. I think it’s the pre-clutter clarity. I read that you wrote “Leaky Little Boat” after waking up from a sleep like that? I did, it was after a show in Mexico and there were a whole bunch of people crashed at our pad down there. It was weird, I’ve had this happen a couple of times, but it was like you know the song by heart before you’ve even heard it. It was sort of playing out in my head. It was like seeing a picture or looking at a painting and not even seeing the process, I don’t know what the process of creation was, it was just – BOOM, the song was streaming from my head. So I jumped over whoever was sleeping on the floor there and ran out on the patio and grabbed the guitar and hit ‘go’ on my little Radio Shack cassette recorder and started singing it - kind of whispering it - and playing it, best I could find the key, and made it a song. Somebody said, “Hey, what is that?” and I was like, “Sshh, I don’t know, I don’t know!” But I still have that tape. That sounds amazing, being a conduit for this music that comes from somewhere, that wants to be heard. I am still in wonder. There are some artists that create and they just don’t know what the source is, it just comes through them. For the longest time, and this is my ego in a way, but I didn’t know what the hell they were talking about, I thought that some of them were making it up. Until I actually had the experience -- if you allow yourself to be open to it long enough, it comes. And it didn’t come to me in a single flash, it came to me moment by moment. I love that part of the process when you look back on what you did for the day or for the hour, it’s hard to believe that you were part of that creative process – like, I don’t know where I came up with THAT idea. And the more surprising they are, I think the more fun it is. I would wonder if it is like learning another language, that moment when you realize that you have slipped naturally into speaking it, and thinking in it, and you are no longer struggling over the mechanics of how to express yourself. Yes, that’s a great, fantastic analogy -- that sounds very, very close to the experience I had. You become fluent in whatever that creative language really is. I was excited recently to unexpectedly find your new EP Four Unlike Before on iTunes, and I really am enjoying the summertime/ acoustic/beach versions of some of the older songs. Is the opening track Mexicosis a new song? Mexicosis is a brand-new track, I wrote it this year. As soon as I get stuff written, I always want to share it. There’s a part of me that goes, “Well, you’ve got to record it right, and let it evolve, etc. etc,” and I always have to be reminded of that by my band and management. But this whole Four Unlike Before thing has basically been a way to placate my drive to keep sharing music, and yet at the same time not give the surprise away, so to speak – let the fruit ripen on the vine with the new album. We put the music together - that’s just us in PH’s bedroom with a whatchamacallit . . . it’s like a computer thing? iTunes? Or, not iTunes, a Mac, or an Apple, no…I don’t know what it’s called, some high-tech digital thing that expedites recording. I feel that our relationship with the audience is good enough that we don’t have to be perfect in our presentation. I think that if you listen to a lot of recordings today, now not all of them – they’re so homogenized and so perfected it takes some of the spirit away, it takes some of the danger out of it, it takes some of the latitude of the expression away. Cuz sometimes with the mistakes – now, this is old cliché – but sometimes the mistakes are part of the art. I think your fans appreciate the excitement in seeing your music evolve and take risks - I’d rather see that any day than something that’s candy-coated perfection. I would too. You know, there’s something to be said for – when you get really good at something, it’s good to somehow keep growing within it. And every song offers that possibility, and so does every performance. If you allow it to become rote, it will be. You have the same relationship with anything for that long, whether it’s a person, or a place, or a performance – It can become mundane, but only if you let it. Anyways, that’s a big tangent (laughs) – it was Mexicosis. I wanted to put it out and the guys, and Chris over at management, said alright let’s do that, let’s find a way. Releasing it through iTunes, we didn’t have to spend time doing a photo shoot and approving artwork and all sorts of liner notes and credits, etc etc. You’re allowed to get it out really quickly, without all of the physical limitations, I think it’s a cool format. It must have also been interesting to revisit and rework some of your older songs as well for this EP, and to allow them to evolve in this new context. Those things happen when sometimes we’ll mess around with songs before a show or rehearsal, warming up, and those are just ideas that stick. For example on "Sleep Like a Baby" if you listen to the rhythm guitar, it’s sort of done in a reggae beat, and the rest of the stuff is just the band’s creativity – we wanted to slow it down and see what the song would feel like with a reggae finish. That La Playa version of "Counterclockwise" was one we did for a benefit that was actually laying around. I liked it a lot when we did it and it wasn’t widely released. It was for a now-defunct radio station in Phoenix called KZON, and only about 5000 copies were released, and we wanted to get it out there. It actually surprised us how fast it came out, and with little fanfare from us, though I had announced it in a letter. How fast it went through the iTunes channels was just excellent. Technology is changing the way that many people learn about and listen to new music. 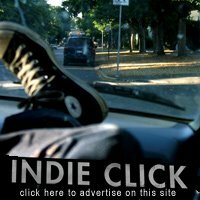 You may have heard about the recent litigation against two Ryan Adams fans who are facing up to 11 years in prison for posting some of his songs on a fansite. How do you, as an artist, think that the growing technology of being able to share music online is helpful or harmful? Is it both? From your perspective, what’s it like? It’s a dangerous genie, but I think ultimately it is going to be helpful. If art is going to have any value, it should be shared. If it’s going to be a conspirator in creating culture, if it’s gonna have any influence with the people then it needs to be shared, and not just from an economic or commercial point of view. The RIAA isn’t interested in culture creation or maintenance or improvement, they’re interested in commerce. Well, maybe that’s the culture they want to create. But it’s a very, very narrow culture, it’s not a humanistic culture. I think that art needs to be shared. I think I’m involved in some way – I hope, I don’t want to sound self-important – in narrowing the gap, by removing middlemen from the process. I think it creates a healthier relationship between art and artist. I think the middleman in art and artistry is new, and by new I mean it’s only a few hundred years old that people have had to find a patron between art and artist. The way art came about is that it was good illumination, it was good guide, it was good expression, it was good fun. Sometimes the middleman in art can facilitate in a wonderful way, i.e. I think iTunes is a great thing, I think it creates an equitable relationship and you can go straight to an artist. I mean, you do have to pay a dollar, but I think a dollar is reasonable to find a song and learn about an artist. But I don’t understand . . . it would be difficult for me to side with the RIAA on threatening to put someone in prison, taking 11 years away from a person’s life for posting a song that was meaningful to them on a fansite. It just seems so backwards and short-sighted. I mean, if they were caught bootlegging the entire Ryan Adams catalog and sending it to Taiwan, that’s clearly a different kind of violation. But come on, eleven years? Really, what kind of message are they sending about themselves? They are so involved in chasing down the dollar that they’re willing to say that we are personally going to imprison someone for celebrating what they thought was good about music, and I think that’s backwards. It’s a tough knot to untie. There may always be a price tag associated with buying music, but not every piece all the time. If we look at the core relationship between art and audience and what that should be, money should play a very small role in the music being good and enduring and helpful in creating a culture whereby human beings begin to understand their relationship with music. The dollar bill is necessary in this society. . . we have to put gas in the bus, and studio time is not cheap. However, to prosecute fans is really a mistake and misguided. Now, you had mentioned a new album and you’ve said would hopefully be released this year. Is that still on track? Yes, it is still in the works. I have seventeen songs written for it, that the band and I are trying out and have have been doing them at soundchecks on these last two tours. 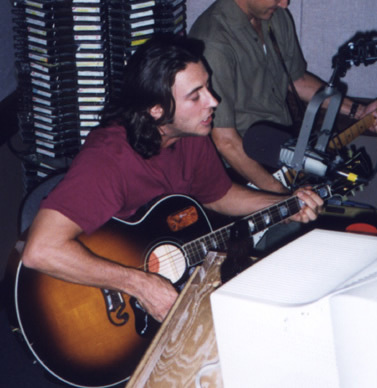 Our big plan was to get a basic familiarity with them at soundchecks, working them through live, and then go into [guitarist] Steve [Larson]’s little home studio and work up rough drafts so that we could all stand back and listen to what was going on, and simultaneously choose a producer, pick a budget, and a studio to record in. Anyways, then [drummer] PH [Naffah] broke his collarbone (chuckles) and rehearsals for Mexico next weekend are actually taking precedence because it’s an immediate need. So we’re woodshedding again starting tomorrow morning. We are still planning for a release later this year -- I don’t like to let too much time pass between studio releases. I know that Live at Billy Bob’s came out and we had to do a round of touring for that. But I like to keep the creative spark fanned and so, yeah, I really want to put out this album this year. Speaking of [drummer/superb photographer] PH, how is he doing? I know you are a proud father of three kids, I’ve seen their painted handprints on your guitar in concert. 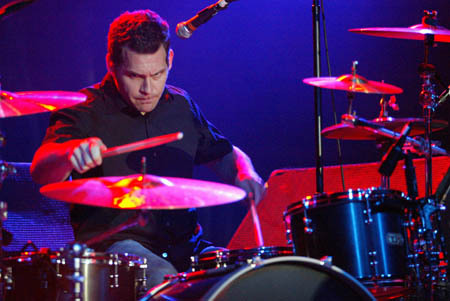 Has the process of being a dad informed or changed your musicianship or songwriting at all? Well, they are obviously such a huge part of my life, being a husband and a father and a provider (aside) – What? Wait, hold on – I’ve got one kid here with an arm full of stuffed animals asking me a question. [Back to interview] . . . Sorry, there is going to be a stuffed animal bath in our backyard. It sounds like fun! Anyway, that is so big that it is hard to answer. I guess I did have a realization at one point, I was on tour and I hung up the phone after saying goodnight to the kids and my wife, and I knew it was going to be a long tour. There was a moment when I kind of let out a sigh to myself and I thought, “Crap, I’d really rather be at home.” And then I thought - Shame on me for saying that. I have this incredible opportunity, this incredible vocation & calling that I mustn’t turn away from. I actually have a very good balance in my life, although being a musician presents a challenge of how to balance your life and how to answer a call like that, and how to become what you think you should become on all fronts. Because there are a lot of fronts: fatherhood and husbandhood and citizenship and peacemaking and rock ‘n’ roll and then just . . . fun. Okay, well, here’s another broad, tough one! Looking back, what is the neatest or best thing that you have gotten to be a part of because of your music? He replied, “Because you said you’re gonna try. I don’t care what you do, and actually you won’t care what you do, but whatever you do you’d better be the best you can be at it.” He’d always said that my whole life, but it was this big Yoda moment. It almost made me cry, I had to think about it a long time and had to figure it out; all these weights, all these other voices. So I let the stipend go and burned all those bridges, I re-formed a band AGAIN, straight out of college in my mid-twenties, at a time when a lot of people are starting to settle down and listen to societal calls. You know, “Two roads diverged in a yellow wood . . .and I chose the one less traveled by and it has made all the difference.” The imperative was that simple. For me it was just to answer that call. My last question is a literary one. 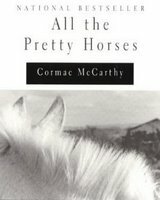 In “Green & Dumb” you have a beautiful lyric, “All the pretty horses come running to her.” That is also the title of a novel by one of my favorite authors, Cormac McCarthy, and I was wondering if by chance there was a connection there. I ask because his books are like the literary equivalent of a lot of your songs, that whole part of the borderlands country and some of the wild outlaw beauty . . .
Wow, that’s a huge compliment to me. Yeah, I have read the Border Trilogy, and I don’t know if I was reading All The Pretty Horses at the time I wrote that, but definitely, his book is on my shelf right now. I love the themes, so romantic and adventurous – on the run, and on the road, away from society. And yet with a real mission and purpose and beauty. I remember in reading his book, my imagination was so wide open because of the figures he uses in his writing. I was hoping that someday I could create or evoke a sense of physical place the way that he did. I still try to work it like that. I hope I can. Well, you should go and assess the stuffed animal damage. I know! Isn’t it great? It’s so weird, you know, like - here I am making up a setlist for a rock show, and fishing stuffed animals out of a keg tub. It’s beautiful, and it’s life, and there’s no incongruity in my mind. MUSIC: There are three tracks for download within the text of the interview, and you should check out their new EP Four Unlike Before, full of harmonica and handclaps. Their 2004 release Americano! is highly recommended 'round these parts as indispensable. eMusic also has their 2000 disc Honky Tonk Union and their live disc from last year, both excellent. And don't forget the Live Music Archive - try the recent Cinco de Mayo acoustic show in San Francisco for some good starters. Nothing compares to a live Roger Clyne & The Peacemakers show. Everything Roger talks about in this interview, brought to life, in vivid color. Great interview. Very inspired and interesting questions. I am completely unfamiliar with this musician, and now I'm currently buying the EP just to check 'em out. Nice job. Sis, you amaze me! This is an awesome interview. I know you worked very hard on this and I'm very proud of you. You should be writing for Rolling Stone. I think someday you will. No, I KNOW someday you will. : ) Good job! Obviously a Pearl Jam fan..points right off the bat. Truly a great interview though..the Leaky Little Boat story and his comments on the RIAA were true gems. Great work and great blog.....keep it up! Heather, congrats on the interview. It's amazing. I thought it would take me a while to read it as it is looong... but it's so interesting it just flew by. Well, I am sure proud of my daughter for actually asking "intelligent and provocative" questions. I suspect many musicians get tired of those really stupid questions like "how do you FEEL about all those screaming teenyboppers who worship you"? I loved the interview, as an old guy who didn't know anything about Roger Clyne.. now I do! I listened to the music as I read the blog... see? I can multitask with the best of 'em! I also suspect many of the questions Heather asked about "balancing" all of the responsibilities of artistic challenge and family responsibilities are somewhat personal... I know it is a challenge being a Mom and a Wife and a Daughter and a Sister and a Friend... I guess we ALL can relate to that. Especially you ARTIST types! I agree with Roger on the topic of file sharing. Sampling some of his music is what lead me to buy his "Honky Tonk Union" album. I'd like to think I'm becoming a fan and not a thief. Great interview Heather! Keep up the good work. very nice, heather........i LOVE the part about the stuffed animal bath. great detail. That's a fantastic interview. I really admire Roger for being one of the best people in music. The San Francisco show was my first show, and now I regret choosing other things over his shows that have been around wherever I've been living. Even without the full band, it was definitely one of the best shows I've ever seen. Anyway, thanks for the really great interview, it really made my morning. Great interview. I found I AM FUEL, YOU ARE FRIENDS as part of a RCPM kick I'm in the middle of. I've been a casual fan for awhile but recently caught Roger and the gang in Colorado Springs. Now I'm completely hooked and I've found your blog which I think is very promising in terms of exposing me to some new music that I might really enjoy. 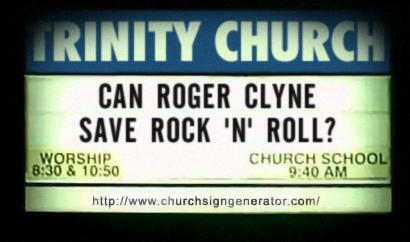 Roger Clyne just may save rock and roll for me. I find it so hard to find pure, straight forward and quality rock. Roger has it all. His music works on so many levels. The obviously hard-working nature of Roger and the band combined with really common settings and themes make the music so accessible to anyone. There are clearly layers of meaning buried in these common everyday themes and characters that you can dig down to if you want to as well. 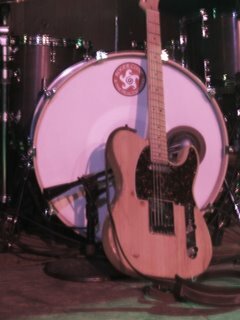 I can put on RCPM and rock out or I can put on RCPM and think about the deeper meaning in the music. It isn't often I can find both of those things consistently in an artist's music. That is how Roger is saving rock and roll for me. Great interview -- where'd you learn to ask such good questions? This post, plus the general passion you seem to have for Roger has convinced me to check out his show at the Social coming up in a few weeks (assuming I don't wind up having to work). You freakin rule! Roger Clyne is amazing. 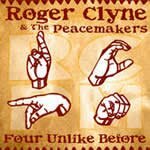 I seen Roger Clyne & The Peacemakers when they made it to Chicago many years ago and have a live recording of it. Ahhh such a great encore of Una Soda. I wuv me some Refreshments. Thank you, Heather! You so eloquently captured the man and his music. You gave first hand insight to the world that many of us who have been long time fans know and love about Roger and the band. The freedom, the independence from corporate rule, the ability for Roger to share what is in his heart without constraints is one thing I truly admire about him. The man, the band, the music...you can't beat the combination! Rock on! Wow! I found the link to your interview on the RCPM website - so glad I did! Your questions are great and I agree, you should be doing this for Rolling Stone! I subscribe, so I'll keep my eyes open for your name... I've loved RCPM for several years now, and everything I continue to learn about Roger makes me love him even more. Nice work!! Great interview. I've been a fan of Roger and his music since 'Wheelie' came out and you really captured the essence of Roger and why we all love him and his music. He's so genuine and down-to-earth that he makes it easy to identify with him. Your interview was very insightful and well-written. I look forward to reading your first review in Rolling Stone. Excellent work. Great interview, Heather. Thank you very much for sharing! Wow...Awesome interview. The "try" reference and all the pretty horses hit home. Thank you for your time and for sharing in an open forum, I have followed Roger, PH and the guys for some time now, and this just validates how much of a "quality" individual, (group) Roger is. 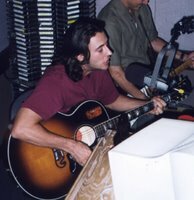 Good Luck with the Eddie Vedder thing, hope to see more of your posts. Great interview. Aren't you the same Heather that runs The Peacemakers web site? If so, I'm sure that is why it is linked up on their site. Or maybe it's just coincidence. I, as somebody else already mentioned, also am a fan since The Refreshments first CD, Wheelie, came out. I didn't know that some of us we're still around! ;-) I guess once you get a taste of it you'll never be the same ... Been to at least 100 shows. Hi anonymous, Nope, I don't run the Peacemakers site, they just linked to the article because I guess they liked it! Wow! Thank you for that! What a great blog. I too have been a fan for alittle over a year and cannot believe how I have become addicted! 8 shows so far...thanks again! I know this is an older interview, but I just ran across it and wanted to tell you that it is amazing! I've been a fan of Roger and his bands since the Refreshments, and the questions you asked are some of the very questions that his music have always brought to my mind. Thanks for an enlightening read! Please help support this show! This is a great interview, and I was wondering if you still have "Feeling" somewhere available for download? It's one of the few songs he plays at concerts that I don't have and can't find, but it's been stuck in my head for days. Thanks!